The new pie is currently available in the U.K.
From White Castle adding the plant-based Impossible Burger to its menu to Del Taco offering tacos featuring a beef-alternative from Beyond Meat, chain restaurants showed a growing interest in vegetarian and vegan options in 2018. That trend appears unlikely to slow down in 2019. Carl’s Jr has already announced it will be selling the Beyond Burger, and over in the United Kingdom, even Pizza Hut is getting in on the action by offering up a vegan pizza laced with the natural meat substitute jackfruit. 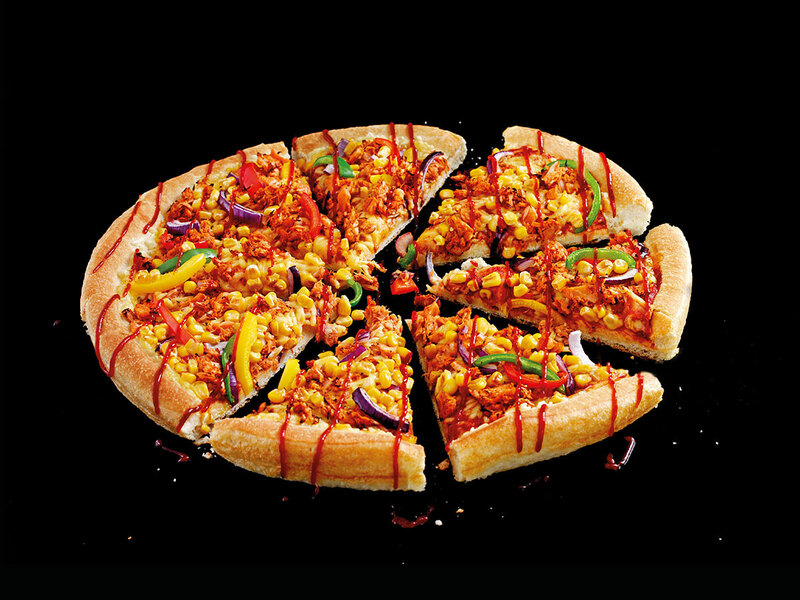 Pizza Hut UK introduced its vegan jackfruit pizza, called the Jack ‘n’ Ch**se, on January 1 as an ode to Veganuary — a movement which encourages people to try to go vegan for the month. Beyond BBQ jackfruit, the pie also includes dairy-free cheese, tomato sauce, sweetcorn, red onion, peppers, and a BBQ drizzle. For those unfamiliar with jackfruit, the tropical fruit that has long been found in the cuisines of places like India and Bangladesh tends to visually resemble chunks of pulled pork. Flavor-wise, it’s a bit sweet and sour and can soak up other flavors and spices, which can easily translate into a delightful sort of Kansas City barbecue taste — which is the route Pizza Hut choose to take. As a U.K. resident and regular flexitarian, this pizza definitely sounded worth a try. Though the chain touts that it added the new item at all 253 of its British restaurants, sadly, that number only includes dine-in locations, so I had to make a bit of a trek to get my hands on one. Overall, the results were mixed though more so due to the local Pizza Hut’s shortcomings than the jackfruit’s. At the counter, the Pizza Hut employee took a peek inside of my pizza box, intrigued since she said it was the first one her location has made. That might explain why they forgot my BBQ drizzle. Whoops! Also, seeking to try the pizza in its most basic form, I opted for the regular Pizza Hut crust — something I haven’t been a fan of since I was a kid. If I ordered the pizza again, I’d definitely go with a thinner crust. But looking specifically at the vegan options, the jackfruit worked wonderfully as a topping. I’ve had jackfruit on pizza before, and though I’ll admit this iteration wasn’t as refined as that more upmarket experience which better emulated the saltiness of pork, Pizza Hut still made the jackfruit shine with its aforementioned American-style barbecue notes, which included a surprisingly strong spicy kick. I was less enthralled with the vegan cheese, which I found to be more gooey and creamy than anything else. Though likely a solid substitute in other situations, on a pizza, this cheese just didn’t quite live up to my expectations when it came to texture. All that said, I wouldn’t balk at eating the Jack ‘n’ Ch**se again. Even better, however, I would love the option to have the jackfruit as a standalone topping on a different Pizza Hut pie with thin crust and real cheese. But regardless, I could see the BBQ jackfruit being a winner. Why not just offer it as a topping and then let customers choose how vegan they want to go from there? That’s something I could get behind all year long.